The engagement ring needs to fit her personal style. Read this guide for the different types of engagement ring settings you should know before you buy a diamond. When shopping for an engagement ring, most people put their focus on the diamond. After all, this is the most eye-catching - and expensive - part of the ring. You want the diamond to be perfect, because, as all the engagement ring advertisements and slogans tell you, a diamond is forever. But don't forget about the ring part of the engagement ring. 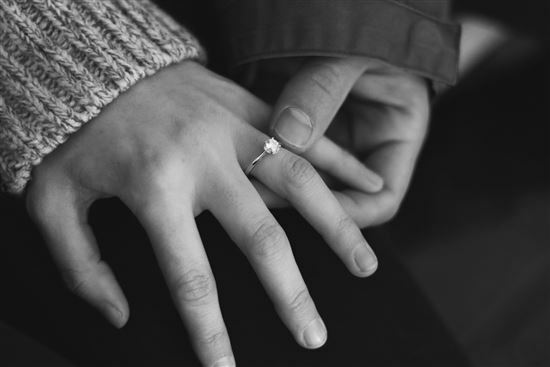 Several aspects of the ring, including the metal used and the style of prongs, will play a key role in not only your enjoyment of the ring down the road, but also in how the diamond looks. Some engagement ring styles make the diamond appear to be larger or will give it a bigger sparkle, all of which you'll love. 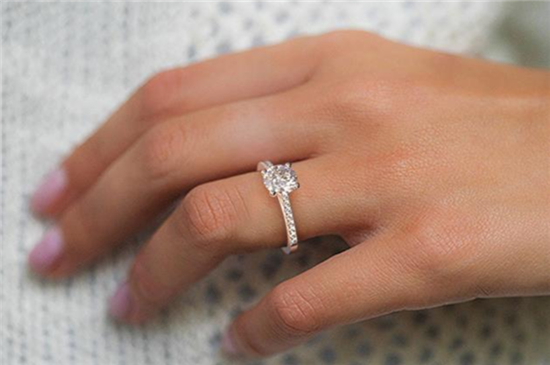 Traditional: A classic solitaire is timeless and shows off the diamond. Elegant: A pave setting adds just the right touch of sparkle on the band. Vintage: A geometric halo is reminiscent of the Art Deco period. Sentimental: A three-stone setting represents the past, present, and future of the relationship. Trendy: A tension setting is contemporary and eye-catching. 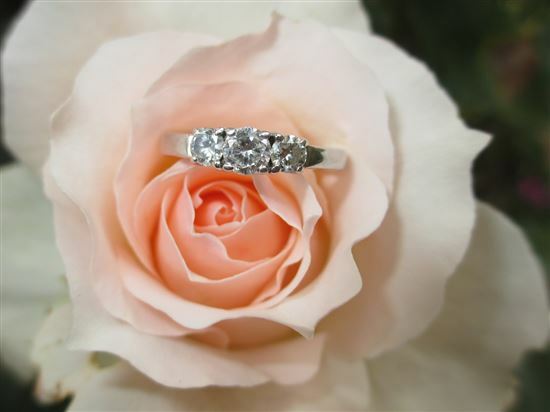 In this article, you will learn about nine of the different options you have for an engagement ring style. You'll also see images of each style that you can click on to better visualize the style. This is the most common type of ring setting. You may also hear it called a "prong setting," as the stone is held in place using prongs. Several different shapes and styles of prongs are available, depending on the shape of the stone in use. For example, round diamonds typically use either 4 or 6 prongs, while princess cut diamonds have 4 V-shape prongs in each corner. 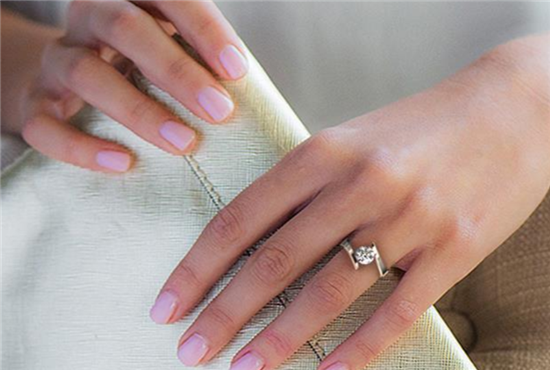 Did You Know: The Tiffany setting is perhaps the most iconic solitaire style setting patented by Tiffany. This style has 6 prongs and a thin knife-edge band. It was designed to showcase the diamond by lifting it high above the band. Advantages: People like the solitaire setting because it supports the stone high above the ring. This lets the stone be the center of attention and even makes it appear larger. It also ensures light can pass through the entire stone, creating a higher level of sparkle and brilliance. Watch out: Because the stone sits high above the ring, the solitaire style can cause you to snag the diamond on clothing, which could cause the prongs to break at some point, potentially causing you to lose the diamond. A solitaire style of ring needs to be inspected frequently for damaged prongs. Best for: The classy, traditional girl. A bezel setting has a metal rim that surrounds the diamond. It has a very contemporary look. Most bezel styles will use a round setting, which accommodates the most common shape of stone. However, if you have a squarish or teardrop stone, the bezel setting can be changed to fit the shape of the stone. Advantages: Because of the metal rim, the bezel setting secures the diamond better. So active girls and those who work with their hands a lot will appreciate the added security. The bezel also makes the ring smooth, so it's also good for girls who work with kids (such as teachers, childcare providers, and nurses). Watch out: Some people dislike a bezel setting because a larger chunk of the diamond is covered with metal. This doesn't allow as much light to pass through, so the diamond may not seem as brilliant. If you dislike this design, you can consider a partial bezel that only goes around two sides. Best for: Active girls and those who work with children. Tip: If you're very active with your hands and don't want your ring to keep on catching on things, you can even get a flush bezel setting. This is when the diamond is set into a hole in the band so that it's flush with surface the band. This way, nothing is sticking out. 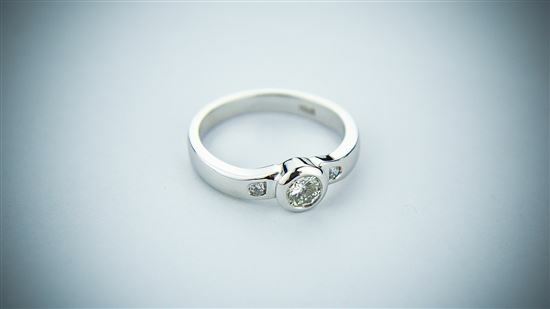 This kind of ring is very durable, however, the diamond becomes less prominent. The halo setting has a ring of small diamonds around the center stone. It has a vintage yet elegant look. There are many different types of halo style rings that can give completely different looks. For example, you can choose to use tiny colored stones, rather than tiny diamonds, in the halo (or vice versa). If you're interested in this style, take some time to study all of the different designs to make sure you have one that will meet your tastes. Advantages: From a distance, the halo style can make the main diamond seem extremely large. It's the best setting for making a big impact on a small budget. You can buy a smaller center stone, put a halo around it, and have it look much larger. And because of all the small diamonds, it also has massive bling factor. 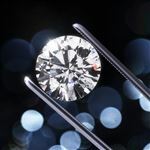 Watch out: The small diamonds can also overwhelm or detract from the main stone when inspected closely. Some people think it's too flashy and looks like costume jewelry. You may also lose a small diamond at some point. Best for: Small budgets and girls who like major sparkle. The channel style of engagement ring has small diamonds set in a row in the band. They're set in a metal "channel" flush with the surface of the band. It gives the band some extra sparkle. Advantages: The metal channel secures the small diamonds so they're not likely to fall out. And since they're flush with the surface, it means they won't snag on clothing either. Watch out: Dirt and debris can become caught between the small diamonds and the metal, so this setting will require more cleaning. Also, it's hard to resize a channel setting since the small stones can loosen or become misaligned. Best for: Semi-active girls and elegant girls. The pavé setting also has small diamonds in the band, like the channel setting style. However, instead of set in a channel, the small diamonds are set next to each other directly on the band using beads, so you see very little metal. You can have multiple rows of tiny stones on the band, or just one row of stones for a thin, delicate look. Advantages: This setting makes the band super sparkly since all you see is a line of diamonds. These tiny stones also work to draw attention to the main center stone. Watch out: You can lose one of the small stones if you're super active with your hands. Best for: Girls who want a little extra sparkle. The three-stone setting consists of a main large diamond in the center, accompanied by two stones on either side. Usually, the two side stones are a little smaller, but some people choose to make all three stones almost the same size. The three stones represent the past, present, and future of the relationship. Advantages: This setting a great way to personalize a ring. You can place meaningful gemstones around the main diamond. Or if you don't have the budget for a large center stone, you can still achieve a greater surface area combined among the three diamonds. Three smaller diamonds cost a lot less than one large diamond. Watch out: Not everyone likes this look, as it detracts from the main diamond. Best for: The sentimental girl. Tip: A way to make the three stone setting more contemporary is combining it with the bar setting style. In a bar setting, diamonds are held in place by small notches in vertical bars on either side of the diamond. This gives a more unique, modern look to this classic style. If you want a modern engagement ring, the tension setting is amazing. This setting uses two pieces of metal to hold the stone in place using pressure. When done correctly, the tension ring almost makes it appear as though the diamond is floating between the two pieces of metal. In reality, the jeweler precisely forms the metal to fit the stone, so that the tension the metal generates by pressing on the stone secures the diamond in place. Tip: If you like this look but are worried about the stone popping out, there's also a tension style setting. In this style, the stone is better secured in place by using prongs or a bezel around the diamond. This gives the ring the look of the classic tension setting, but the diamond has less chance of popping loose. 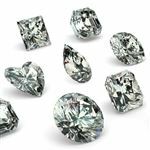 Advantages: Because so little metal actually comes in contact with the diamond, as much light as possible strikes the stone, giving it great brilliance. The suspended stone also gives the ring a very unique, contemporary look. Watch out: A blow in the right direction could knock the stone loose, though the chances are low. This setting is almost impossible to resize since the stone is held in place by a perfect pressure. So make sure you get it custom fitted or know the exact size. Best for: The modern trendsetter. Vintage style engagement ring settings are great for someone who wants a unique look with charm. Vintage style rings are inspired by the different time periods, such as Art Deco or the Victorian era. Often, they have a lot of intricate metal work, including metal beading, scroll details, or geometric shapes. You also may see a lot of halo or pavé elements. To ensure this style of ring will look good and will avoid having any diamonds popping loose for a long period of time, the jeweler creating this ring needs to use outstanding craftsmanship. Advantages: Vintage rings are very unique and make a bold statement. 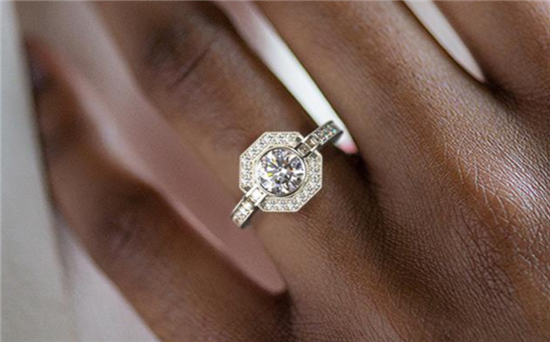 Watch out: The minute details in the design of this ring can make it tougher to clean. This is when many small stones are clustered together to look like one larger diamond. Because small diamonds are used, you can form a lot of unique designs and shapes. To see some examples of beautiful cluster rings, check out James Allen's Royal Halo collection. Advantages: This is good if you're on a very small budget. A lot of small diamonds are much less expensive than one single larger diamond. With this setting, you can achieve a larger surface area for a lot less. This is a good budget-friendly choice for girls with larger hands. Watch out: A lot of small stones also mean a lot of crevices. So it can be harder to clean. Also be careful about a small diamond falling out. Best for: Small budgets and girls who want something unique. 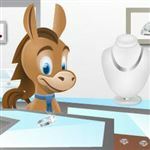 Finally, you always have the option of selecting a custom style or a special design that the jeweler carries. If you're interested in a unique ring, this is the way to go. Or if you have an artistic side, you may want to design your own ring. 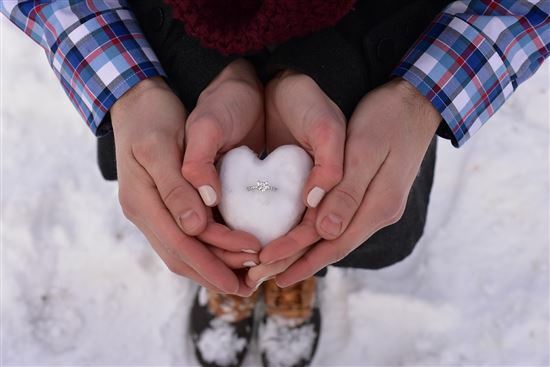 Find the right jeweler, and you may have the option of having a ring created locally that will be all your own. 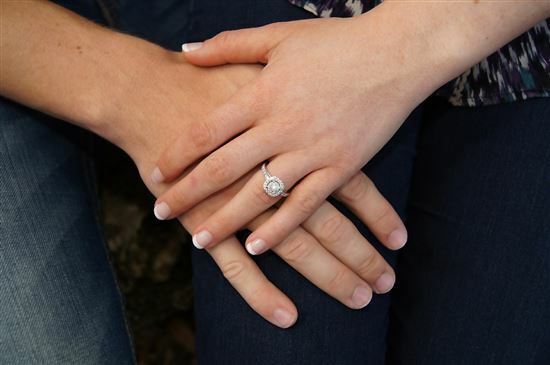 Understand that there are some limitations in designing an engagement ring, as the jeweler needs to be able to securely attach the diamond to the ring, Any design you create has to be practical and trustworthy as well as beautiful … kind of like a good marriage! Cathedral setting. This is a very elegant setting style. Instead of the band being a perfect circle shape, the band sweeps up to meet the diamond on either side (looking like the arches on a cathedral). This also makes the diamond a little more secure since the metal helps to keep it in place. A cathedral setting can work with many styles, including solitaries, bezel, pave, channel, and halo. Split shank. Shank is another word for the band. 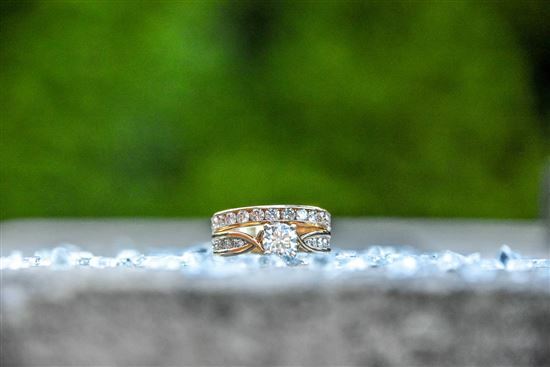 A split shank is when the band splits into two as it reaches the center stone. This gives the band some extra width without looking too chunky. It makes a good choice for girls with chubbier fingers, as the wider-looking band balances out wider fingers. Knife-edge. This style has a sharp edge around the band (instead of the usual rounded rings). This gives the band a clean thinner appearance, which really helps to make the stone pop more. A downside is that wearers may find it slightly uncomfortable because of the sharp edge. The famous Tiffany setting has a knife-edge shank. 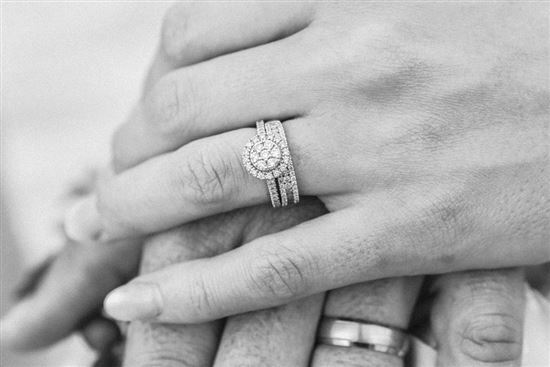 Leave a comment about Engagement Ring Styles: How to Choose a Ring?